Today's One Week, One Pattern giveaway prize has been generously donated by Fabric Godmother. If you've ever wanted your pattern and fabric wishes to come true (geddit?!) then today might just be your lucky day. Fabric Godmother is offering one lucky winner the pattern of their choice plus £20 to spend on fabric. What a wonderful prize! There are some fab patterns to choose from and the selection caters for all dressmaking tastes - from everyday basics and children's wear to vintage-inspired and high fashion. The full range can be found here. The fabric department is equally impressive, with a gorgeous range of stretch cottons, organic jerseys, wax print cottons and designer fabrics. To be in with a chance of winning, simply leave a comment on this post. You're right, that is a terribly impressive range of fabrics and patterns! It's getting better and better with every day! Really great action! Such beautiful fabrics! Great giveaway! the fabric here is awesome! Well now I'm trying to convince my brain that I don't need "one of everything" and I would have to file for bankruptcy if I bought everything I like over at Fabric Godmother. Lovely! Thankyou - fingers crossed! Omg another fabric site for me to drool over! Yeee, thanks for the giveway! Fantastic, thanks so much for organising! Another fabulous giveaway from another fabulous sponsor - thank you fabric godmother! I think these are just amazing. Gorgeous selection! Another lovely giveaway, lots of great choices! Another great giveaway, please count me in! Another great giveaway - count me in please! Wonderful prizes, please count me in! Sso nice to see a lovely selection of viscose, yum. I am in! Fabric godmother indeed! Lovely selection of fabrics, which really caught my eye. So many wonderful giveaways! What a fab contest! Some perfect prizes with these giveaways! I'm in! Another great prize! Thanks for hosting this week of giveaways. They are all so lovely! I've been after those Charley Harper knits for ages! Another crossed-fingered comment from me! Fabric Godmother have some super gorgeous things in stock. Count me in, love Fabric Godmother! Wow, they have some beautiful fabrics and lovely patterns. Loving the organic jerseys and I spied some chocolate lace that will be perfect for a future project. Thanks for the chance to win. I'm thinking a Jamie Christina Lark cardi, in one of the Roma jersey fabrics would be nice. Very nice indeed. And cosy. What yummy fabrics! Thanks for the chance! I love the Charley Harper birds! How funny - I have been lusting over the organic cotton jersey on fabric godmother this week - everything is crossed for this one! I want all of their fabrics!! SO exciting! I LOVE the fabric pictured. Thanks for the giveaways! I like this one, will give it a shot! Am I the only one to think that the picture of the organic cotton jersey looks like frontals of cardinals with their wings against their sides? Charley Harper jersey, be still my heart!! Yes they do have a great choice of fabrics - really like the birds of paradise!! These are great giveaways, thanks for the chance to win such lovely things. You are giving out great prizes. Fabric Godmother has lots of lovely fabrics. Thanks for another wonderful give away. Oooh, I bought some lovely denim from Fabric Godmother recently, I'd be very tempted to buy some more if I won! Thanks for spoiling us again! Another lovely giveaway, so count me in please! They do have some beautiful fabrics! Thank you for these giveaways, they are all amazing! Thanks again for the opportunity Jane. Count me in please. oh, their fabrics are amazing! seems I was looking in totally the wrong place for printed viscose... well now I know for future! 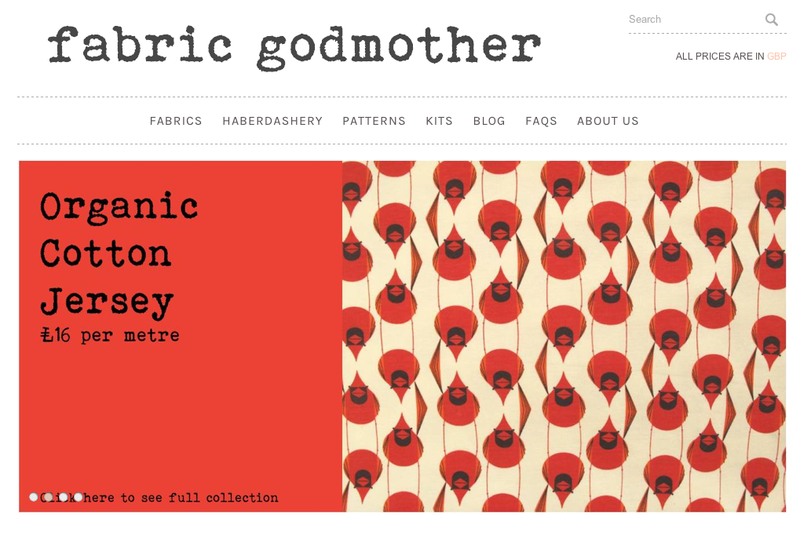 Fabric Godmother - this would certainly be a dream come true. 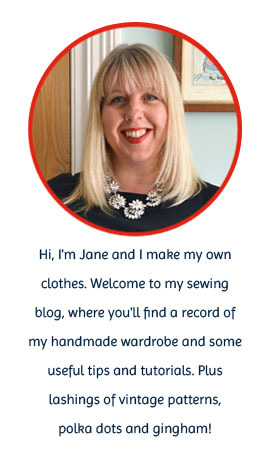 Wow - another website of fabric and patterns to check out! Thanks again for a chance to win this fantastic giveaway! Please enter me - what a lovely selection of prints in the jersey! Would love to enter, never had anything from fabric godmother, but heard a lot about them. So many amazing fabrics - I would love to win this one! I need some beautiful stretch cotton! My email is pfruit@comcast.net! Count me in! Beautiful fabric. This an an Alabama Chanin devotee's dream come true.....oh please let it be me, finger and toes crossed. Thanks for the opportunity to win. Fingers crossed! They have a great variety of patterns...I even noticed one on Cloaks, and I've wanted one of those for ages! Wow -that is quite an inventory. that is a wonderful prize - some lovely cotton jerseys there. Another giveaway! Thank you for your hard work organizing this! This is an exciting giveaway. Thank you! That site is ridiculously fab. I clicked over and got lost for 20 minutes just coveting everything I saw! Love the fabrics, thank you for another lovely giveaway. Some gorgeous fabrics there - I love the mazzi stretch cotton with the large red roses! Thanks for the giveaway. Giveaway from the Fabric Godmother, yay count me in for one more! I must take a look. Thanks for the chance of winning. Great giveaway, I love fabric godmother! What amazing giveaways you have organised. Fabric Godmother is fabulous. Please include me. Thank you. Great giveaway, I'd love to win to get my hands on some of their gorgeous fabric. Count me in. Yet another fabulous prize! Would love to win! Thanks for organizing all these great giveaways! I am very excited about this one. Thanks! Yes please! I love Fabric Godmother's selection of fabrics. Got to be in it to win it! Please pop me in the bag. Oh me oh my!! Yes please!! A pattern AND fabric? Wonderful! I'd love to win - thanks for the opportunity! Some nice fabrics to choose from! lovely fabrics, it would be amazing to win! A pattern AND fabric?! I'm keeping my fingers crossed! I hope my wish is granted - thank you! Very cute! Buying fabric online is so much fun! I love the little birds. Most excellent! thanks for hosting! #OWOP starts here for me in 40 minutes!!! Another lovely giveaway - thank you very much!! You've gotten together such an incredible choice of giveaways! Thanks! I LOVE awesome knit prints! Thank you for the giveaway. Another fabulously generous giveaway, I hope I'm lucky. these giveaways are so generous! Thanks for the giveaway - wish me luck!! It's been a while since I've won anything and I'd love to win this one! Anything concerning fabric is wonderful! Such a fabulous fabric selection! What a fantastic prize. Please count me in. I've often risked drooling on my laptop admiring their fabrics… Great giveaway!